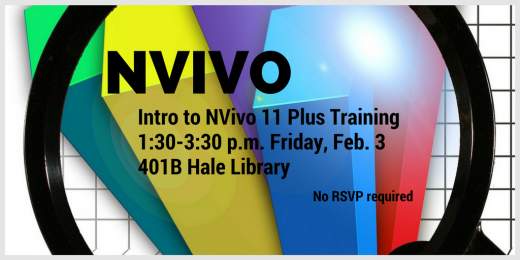 An “Intro to NVivo 11 Plus” training is scheduled from 1:30-3:30 p.m. Friday, Feb. 3, 401B Hale Library for all faculty, graduate students, and staff who may be using this qualitative (and mixed methods) data analysis tool. There will also be a brief section on some of the new affordances of NVivo 11 (including network analysis and sentiment analysis). NVivo 11 will be available to all who are eligible for the K-State site license. Downloading from the QSR International site (vs. the K-State download) will save on software patching; however, the K-State site license must still be obtained from the protected site below. These events are scheduled for Hale 401B from 1:30 – 3:30 p.m. as well. To access the downloadable software, go to the QSR International Downloads page. The activating site license keys may be accessed at k-state.edu/ID/KStateNVivoDownload with a current eID and password. Those off-campus and / or undergraduate partners who are working with active and eligible K-State faculty, administrators, staff, and graduate students may be allowed to use the K-State license during the duration of the non-commercial K-State related research project. The NVivo 11 Plus / NVivo 10 site licenses will end in late March 2017. Since this is a proprietary software tool, any contents inside an NVivo project will not be accessible without this tool. Those who will not be purchasing the software or subscribing to it may want to export their data tables and data visualizations before the end of the site license. If there are questions, please email shalin@k-state.edu or call 785-532-5262. Thank you for your interest.